In 2010, I wrote my first book The Accidental Sales Manager. The idea for it came to me as I watched my clients in different industries make similar mistakes around hiring and on-boarding new sales reps.
Company presidents and owners often left these new reps largely to their own devices, after spending a few hours with them on the first day and having them chat with a few other employees. When the rep underperformed or quit, these company leaders were baffled and upset. Many felt hesitant to hire another rep for fear of the same thing happening again. In The Accidental Sales Manager I stress the importance of pre-planning for the new salesperson (instituting a comprehensive orientation to the company; setting tenure appropriate productivity goals and quotas; providing product training) as well as supporting them once they join the company (creating a sales contest; accompanying (or monitoring) them on sales calls; meeting with them regularly). Yet, no matter how well any manager plans, problems occur with sales people and within sales organizations - at companies of all sizes and industries. It's inevitable. To address these issues, I wrote a new book, The Sales Leader's Problem Solver (Career Press 2016). This past week, USA Book News selected it as the Winner in the category of Business: Sales. 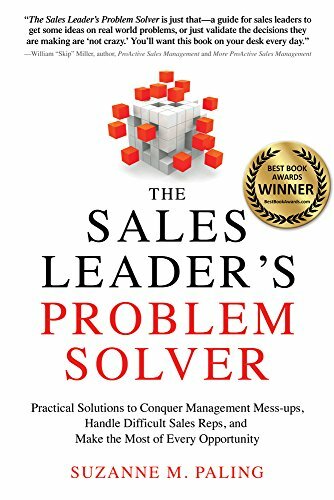 In each chapter, I recommend an approach to take for solving that particular sales management problem. This includes: clarifying the problem, gathering data, determining potential solutions, presenting the solution to a supervisor or advisor, and finally, addressing the issue with the rep.
To prevent the problem from reoccurring, I make suggestions around the interview process, new hire orientation, and the current staff. Above all else, the book reinforces the fact that being the one to address and solve a difficult problem represents a real leadership and career opportunity.